The information literacy program includes a full day introduction for each Year 9 class. The aim of the information literacy program is to provide students with the skills to be independent learners. It is based on the six stages of research, namely: defining, locating, selecting, organising, presenting and assessing. 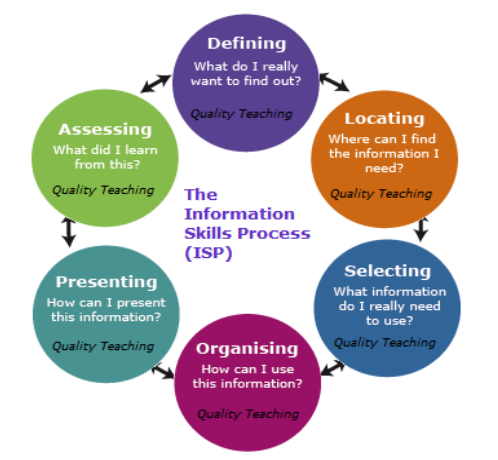 The information literacy skills learnt in the induction are further developed throughout the curriculum and are embedded in a number of assignments. Session 2: What kind of researcher are you? Let’s twerk our way to research skills! Time to get to know the LRC: LRC tour, nuts and bolts of the library. Learn what to use, when and how, and what not to! Premiers’ Reading Challenge: who will win in 2019? 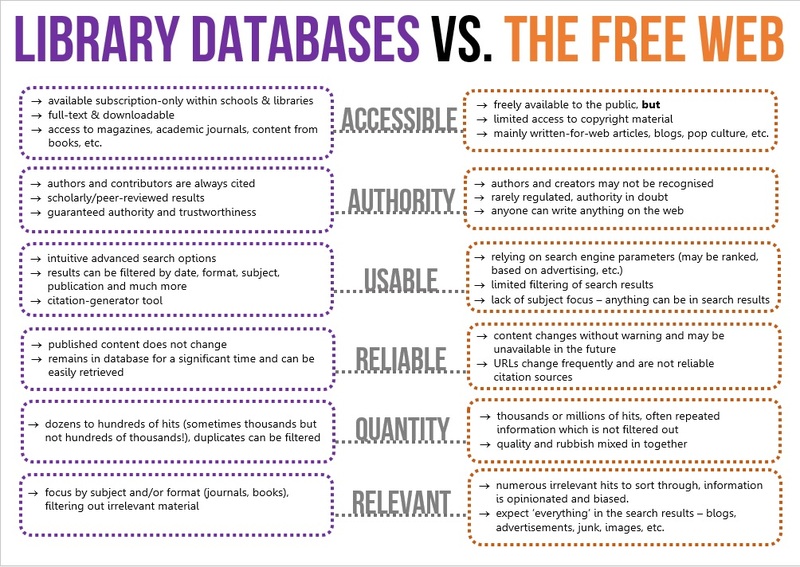 Make sure to use the Library Catalogue or databases to search for your resources! Need help with the catalogue? Just read our FAQ page. Make sure to check our info on citation and referencing here! And writing and presentation tips here! communicated using the most appropriate medium for the task and audience/webpage/powerpoint. Before you decide to use a webpage for your assignment, you need to evaluate it by these criteria. This is sometimes known as the 'CRAAP' test. Look through the tabs and ask yourself these questions about the information you have found. Remember - when evaluating sources, your assignment instructions play an important role as well because that is what dictates the type of information you are allowed or required to use. When was the source published or written? Is the time of publication or writing important for your topic? Is there more current research available on the same topic? Is the date evident for any visual aids, such as graphs, charts or tables? Are the links up to date or are they broken? Currency is only important if your topic dictates using the most recent information available. For example, if you are writing a research paper about the Civil War, currency is not important. However, if you are writing about the treatments for autism, currency is important, as science and technology change quite rapidly. Does the content address the topic effectively? Are the key questions about your topic answered within the content? Does the content seem like it is likely to help your research? Does the content provide any information that is new or useful? Is the information basic and cursory or detailed and scholarly? Is the information substantial? Was the page worth visiting? Who is the intended audience of page? If the content is lacking or does not address your topic, you should not use the source. Can you find the authority or credentials of the author? Is the author an expert in this field? Are they qualified to write about this subject? Does the author or publisher provide contact details? Can you find the authority or credentials of the publisher? What if there is no author for an internet source? If you cannot find information regarding the authority of the author or publisher while evaluating sources, you should not use the source. For internet sources without an author, the reliability is in question. Websites or publications by government agencies or well-established non-profit organizations are more reliable even with the absence of a named author. Does the information in the article appear correct? Does the article have a bibliography or reference list? Is it clear where the author got his or her information? Is it obvious who is responsible for the information? If you cannot verify that the information is correct or that the author is an expert on the topic, you should not use the source. Is the objectivity of the source clear? Does it seem impartial? Is the information fact or personal opinion? Is there any obvious bias? e.g. political, ideological, cultural, religious, institutional, or personal bias? Is the website part of a commercial organisation, a political party or an organisation with a specific agenda, including advertising? If yes, question the motives for publishing the information. Is the purpose obvious and clear? Is the sole purpose of the article to give information, or does it promote or try to sell something? i.e. is the purpose to inform? teach? sell? entertain? persuade? The nature of your assignment and your topic determine how important it is for your sources to be objective. A lack of objectivity is not an automatic reason to dismiss a source if it fits the assignment and the topic while still allowing you to find other sources with opposing viewpoints.